Orchids are one of the largest families of plants in the world, with around 25,000 different species recorded. 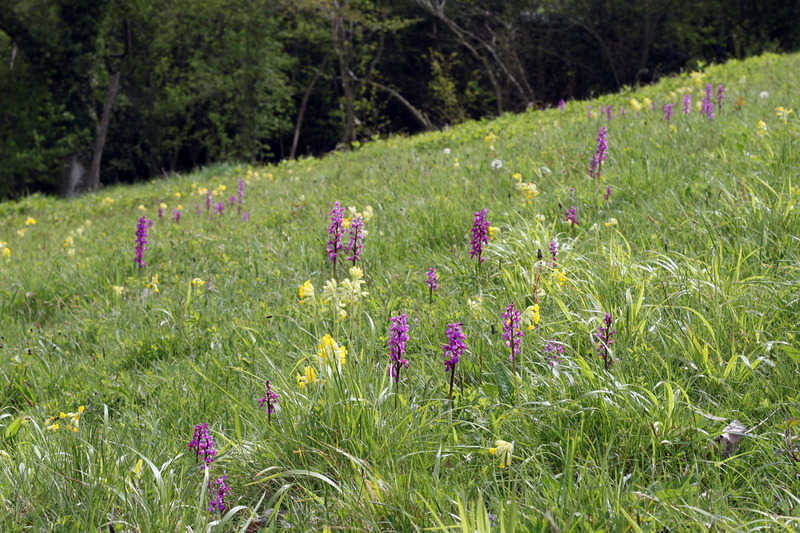 Britain has over 50 species of wild orchids, of which around 18 occur in Herefordshire. Some are relatively common while others, such as lady’s slipper and ghost orchid, are extremely rare. All are protected by law. 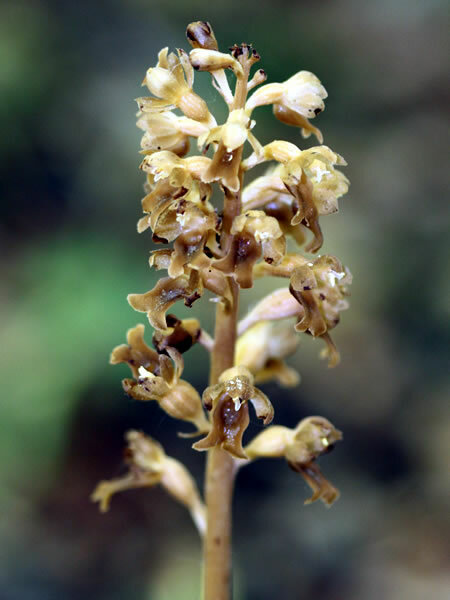 One of the earliest orchids to appear is bird’s-nest orchid Neottia nidus-avis, which flowers between April and July. The plant grows up to 25cm tall and produces a cluster of large brown flowers. The stem is often light brown or white and has no leaves. This unusual plant does not produce chlorophyll and so can not photosynthesise it’s own food. Instead, it is totally reliant on it’s relationship with soil fungi. All orchids rely to some extent on soil fungi for food, either as germinating seeds, seedlings or adult plants. The orchid roots and fungi form a relationship, called a orchid micorrhiza, which involves the fungi colonising the plant roots. This allows the orchid to derive some or, in the case of bird’s-nest orchid, all of its nutrients and energy from the fungi. 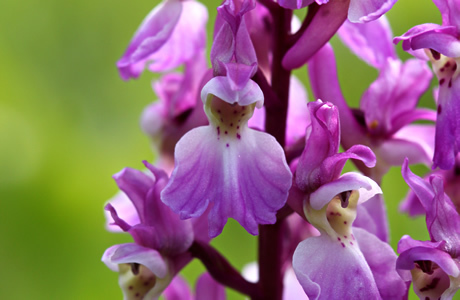 Also flowering between April and July is early purple orchid Orchis mascula. 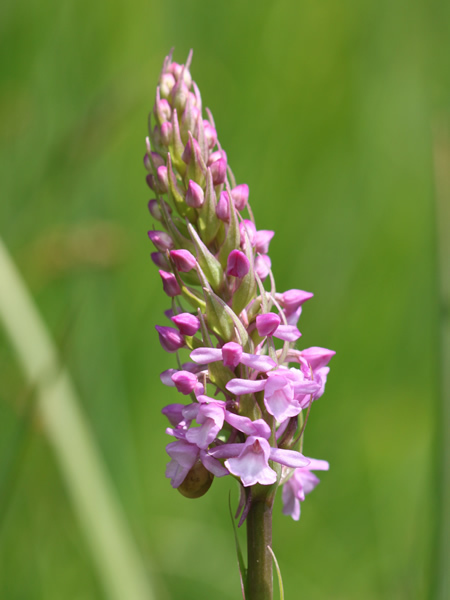 This plant is found in a wide variety of habitats, including open meadows and woodland. It produces a tall stem, sometimes 50-60cm, and a loose cluster of 6 to 20 flowers, ranging in colour from pink to purple. The lance-like leaves are grouped together at the base of the plant and are often mottled with purplish spots. The flower is pollinated by a range of bees and wasps, although it produces no nectar. The name mascula is derived from the Latin for ‘male’ and refers to the testicle-like shape of the tubers. In the Middle East and Turkey the tubers are ground to make a sweet nutritious flour called salep, widely used in drinks, cereals, bread-making and traditional medicines. Green-winged orchid Anacamptis morio (April to June) can sometimes be confused with early purple orchid. It is distinguished by the parallel green veins on each side of the purple flower hood, from which it gets its name. 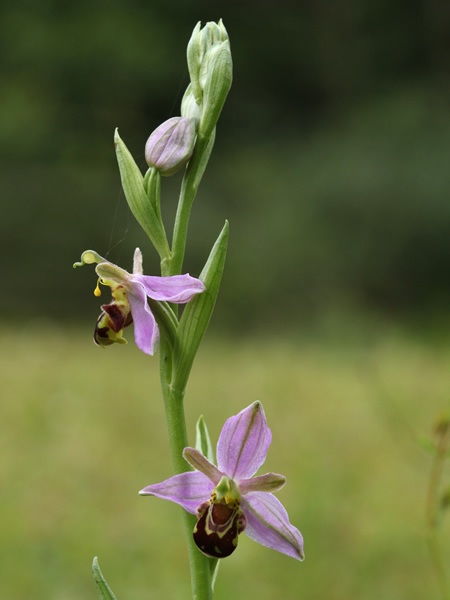 This beautiful orchid grows almost exclusively in old, unimproved meadows and is seriously threatened by loss of habitat. 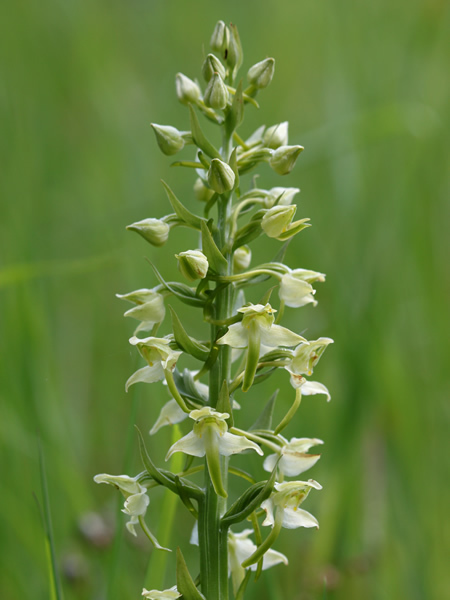 Greater butterfly orchid Plantanthera chlorantha flowers between May and July. The plant produces a pair of broad, shiny, rounded leaves at the base of the stem, which grows up to 25cm tall. The greenish-white flowers form a loose spike and have a vanilla scent, which is particularly strong at night. Unlike their more colourful cousins, butterfly orchids may be easily overlooked. 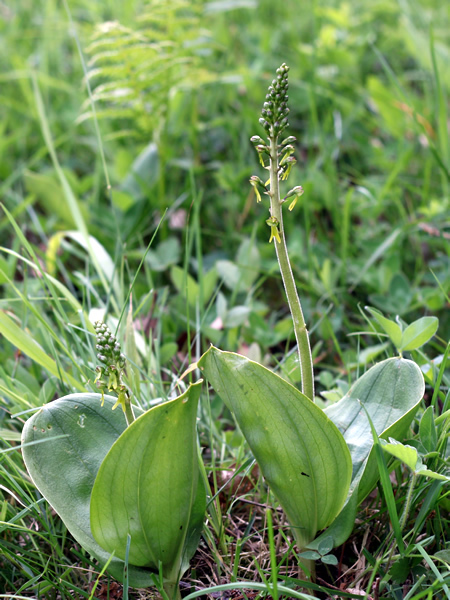 Also flowering in May is common twayblade Neottia ovata, a close relative of bird’s-nest orchid. This plant produces a pair of broad leaves close to the ground, hence it’s common name, and a tall stem (between 20-60cm). The flowers are lime green and vaguely humanoid in shape. Like the other less brightly coloured orchids, it can be difficult to spot, although it is relatively common and can occur in large numbers. Appearing towards the end of May are the first flower-spikes of common spotted orchid Dactylorhiza fuchsii (flowers May to August). 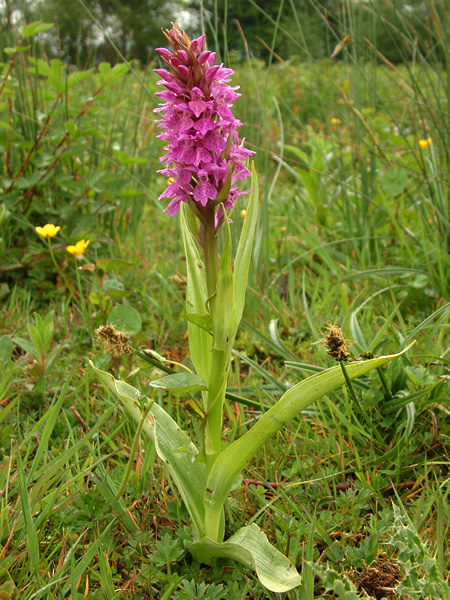 This is the UK’s commonest orchid, found in a wide variety of habitats and quick to colonise new sites. The plant produces narrow spotted leaves at the base of the stem, which grows to 30cm tall. The flowers form a tight cluster and range in colour from white to pink with purple markings. 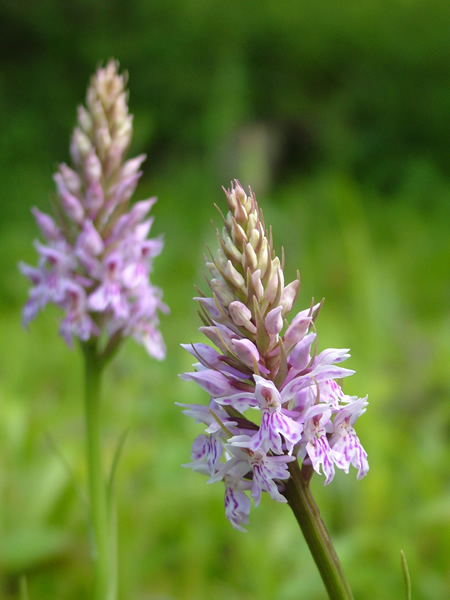 A similar, closely related species, is heath spotted orchid Dactylorhiza maculata, which prefers more acidic soils, but is often found growing alongside common spotted orchid. 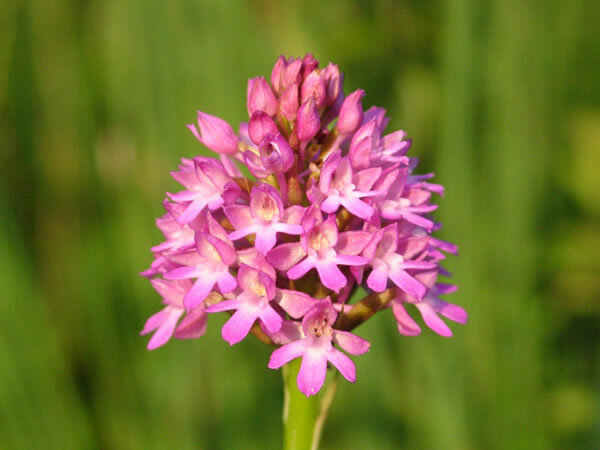 Flowering at around the same time is pyramidal orchid Anacamptis pyramidalis (June to August). The plant produces narrow lance-like leaves at the base of the stem and grows up to 30cm, although occasionally taller. It produces a tight cluster of pink or purple flowers in a pyramidal shape. 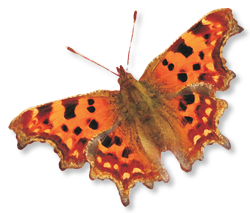 The flowers are specially adapted to be pollinated by butterflies and moths. Like the early purple orchid, the tubers of pyramidal orchids are ground to make a sweet flour. In England during the 17th and 18th centuries, before coffee became popular, the flour was used to make a sweet drink called saloop. 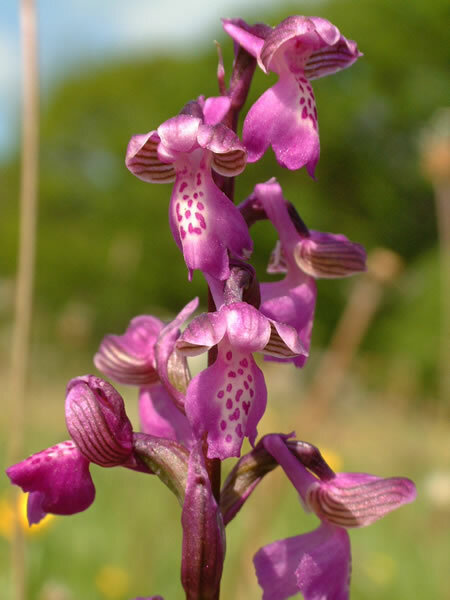 One of the most spectacular orchids, both for its size (up to 70cm tall) and striking purple flowers, is the southern marsh orchid Dactylorhiza praetermissa (mid June to late July). 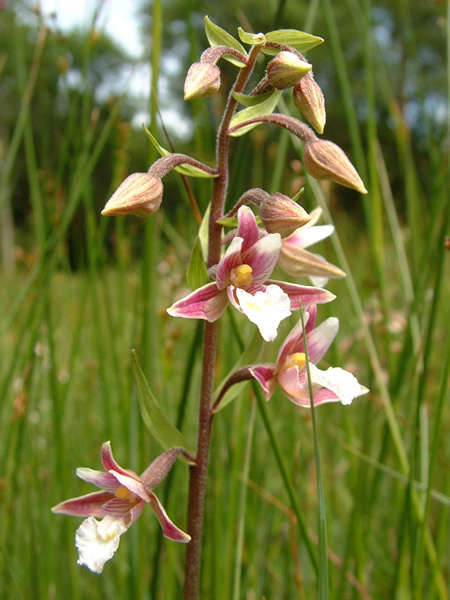 It is often found growing in marshes, fens and damp meadows – habitats that is sometimes shares with fragrant orchid Gymnadenia conopsea and marsh helleborine Epipactis, both of which are rare in Herefordshire. Orchids noted for their beauty and specialisation of form are those that mimic insects to encourage pollination. Of these fly orchid Ophyris insectifera is very rare in Herefordshire and being quite slender and growing in dappled shade is hard to spot. It is most likely on the limestone of the Doward and would be of great interest and should be reported if found. More likely to be seen and often turning up in new places is bee orchid Ophris apifera. As the name suggests, the plant has evolved to mimic bees, an example of sexual mimicry, although most plants in the UK are thought to be self-pollinating. Herefordshire’s rarest orchid is the ghost orchid, which has only been sighted a handful of times since it was first recorded in Britain, in Herefordshire, in 1854. The last recorded sighting was in September 2009 but before that it hadn’t been seen since 1982. Finding this or even a fly orchid would ensure your name is long remembered in the record books. Please remember: all native wild plants are protected by law and must not be picked or uprooted. Please leave them for others to enjoy.